Endodontic Surgery for Treatment of a Fistulated Molar Abscess in an Orangutan. An adult Bornean orangutan was treated for bacterial labyrinthitis, which was a sequela to a molar abscess and maxillary sinusitis. Antibiotic therapy and endodontic surgery led to complete remission of clinical signs. A 24-year-old, 145-kg, male Bornean orangutan (Pongo pygmaeus pygmaeus) with a history of chronic intermittent nasal discharge was examined because of acute onset of ataxia. A recent episode of bilateral suppurative nasal discharge had been treated with oral demeclocycline hydrochloride,(a) with slight remission of signs. However, 2 weeks later the animal became acutely anorectic, lethargic and unable to maintain his balance. The orangutan was anesthetized via a blowgun dart(b) with 150 mg of phencyclidine hydrochloride(c) (0.96 mg/kg body weight). A general physical examination revealed maxillary sinusitis. Oral examination revealed a carious lesion (Fig 1 and 2) on the occlusal surface of the upper left 1st molar. (The dental formula for this species is: I 2/2, C 1/1, P 2/2, M 3/3. (5)) Miled ulceration and inflammation of the pharyngeal lymphoid tissue also was observed, but the oral mucosa and gingival were normal. It was concluded that the ataxia was due to labyrinthitis caused by chronic bacterial seeding from purulent sinus exudates. Bacteria isolated on culture of nasal exudates included Proteus sp, diplococci, and gram-positive rods. All were determined to be sensitive to gentamicin sulfate, using an antibiotic disk sensitivity method. Gentamicin-sensitive Pseudmonas sp was isolated from pharyngeal mucus. surface of upper left first molar of an orangutan. 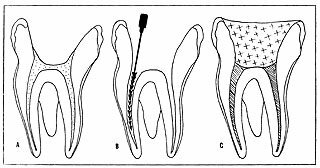 Fig 2 – Schematic drawing showing molar decay pattern prior to treatment – enamel (a); dentin (b); pulp canal (d); cementum (e). Because of the animal’s debilitated condition, surgical measures to correct the dental problem were not taken immediately. Gentamicin sulfate(d) (600 mg) and benzathine penicillin(e) (4.5 x 10^6 units) were given IM on day 1; gentamicin (300 mg IM via blowgun dart, SID) and ampicillin(f) (1.2 g orally, TID) were continued for 18 days. Within 48 hours after the initiation of antibiotic therapy, appetite and activity had been regained. Ataxia gradually diminished until it was only slightly noticeable by day 10 and was undetectable by day 16. From days 19 to 33, an oral sulfonamide preparation(g) was given daily, after which the use of antibacterial preparations was discontinued. Twenty-eight days following the first physical examination, chemical immobilization was performed in a similar fasion. With the supplementary use of oxygen, nitrous oxide, and halothane anesthesia, measures were taken to correct the dental problem. After isolating the upper first molar under a rubber dam, the decayed enamel structure was removed, using an air-driven high-speed dental handpiece with an inverted cone bur. The softer carious dentin was removed with a round bur in a slow-speed air-driven handpiece. The pulp cavity was entered and the overhanging dentin ledges were removed, creating a smooth-walled direct line of access to the 3 root canals (Fig 3A). The canals were identified after the debris had been removed from the pulp chamber. Their correct depth was determined by inserting a radiopaque instrument of known length into each canal before exposing the radiograph (Fig 3B). The distance remaining from the tip of the instrument to the apex of the tooth could then be judged. The root canals were debrided with root canal reamers and files and irrigated with solutions of hydrogen peroxide and dilute hydrochloric acid. overhanging dentin ledges were removed. Absorbent paper points were placed and left in each canal. Several large cotton balls dampened with metacresylacetate(h) were packed tightly into a firm solid base in the pulp chamber. The remainder of the cavity preparation was filled with a composite dental restorative material(i) and trimmed so that the 1st upper molar was free of traumatic occlusal interference. Three months later, the root canal procedure was completed. At that time, the previous composite filling was removed along with the cotton balls and paper points. The canals were debrided of remaining decalcified dentin and enlarged. A zinc oxide/eugenol root canal sealant containing metacresylacetate and prednisolone sodium succinate(j) was used to completely fill the canals (Fig 3C). The coronal portion of the pulp chamber was prepared to receive several retention pins(k) to provide additional structural support for final filling material. The final restoration of the tooth was accomplished by injecting composite restorative(l) into the cavity preparation and adjusting for proper occlusion. The animal has been clinically normal for over 12 months following initial endodontic treatment. The occlusal decay pattern encountered in this case is termed fissural caries. This condition is commonly seen in man and is frequently overlooked in its early development. (6) The lesion found in the first molar of the orangutan represented the result of a long period of slow demineralization of the tooth structure. This decay pattern follows the direction of the enamel rods deeper into the occlusal fissure (Fig 4A), eventually diverging away from the dentinoenamel junction as it spreads further into the tooth. 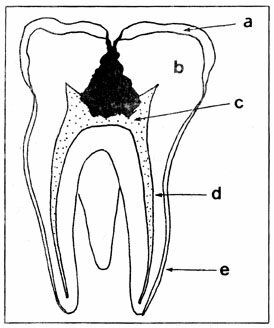 Decay continues through the dentin, advancing toward the pulpal tissue (Fig 4B). Ultimately, the structure of the tooth is undermined, introducing oral microorganisms into the cardiovascular system via the dental pulpal tissue (Fig 4C). Early detection and restoration are imperative, owing to the tendency of these microorganisms for deep and rapid burrowing and lateral spreading through the dentin. In this case, the consequence of the abscessed tooth was seen as a fistulous tract leading to the maxillary sinus, resulting in sinus infection with vestibular ataxia. The same dental lesion may be associated with different clinical signs from species to species. Perforated frontal sinus in man, the “weeping eye” in dogs and cats(7), and the asymmetric lateral distortion of the maxillary sinus wall on the face of the horse(8) each represents species manifestations of fistulated molar teeth. 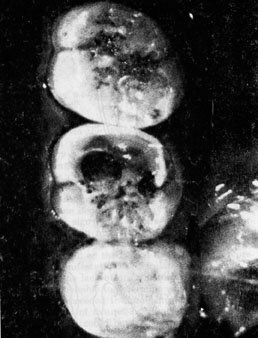 spread of conical-shaped decay pattern (darkened area) through enamel. Base of cone is deepest part. pattern, invading the pulp cavity. Because of the lack of prior history of dental examination, it is impossible to determine whether a developmental defect preceded the problem in this case. The incomplete fusion of fissures or grooves found between the cusps of teeth could have been the inciting factor. Fortunately, the technology exists, and is readily available, to correct this type of problem after it has occurred (i.e., root canal therapy), or to prevent its occurrence with early diagnosis. This preventative procedure is known as “pit and fissure sealant” therapy(9). The human dental literature has adequate discussion of theory, methods, and materials(10-12). Therapy involves use of ultrahard, fast-setting liquids introduced into the fissures in such a way as to prevent the continued access of cariogenic bacteria. From the Jennings Center for Zoological Medicine, Zoological Society of Society of San Diego, PO Box 551, San Diego, CA 92112, where Dr. Fagan is dental consultant and Dr. Robinson is director of veterinary services. The authors thank Michalel Moran for illustrations. Declomycin, Lederle Laboratories, Pearl River, NY. Miniject, Peter Ott AG, Basel, Switzerland. Sernylan, Bio-ceutic Laboratories, Inc., St Joseph, MO. Gentocin, Schering Corp., Kenilworth, NJ. Bicillin Fortified, Wyeth Laboratories, Philadelphia, PA.
Omnipen, Wyeth Laboratories, Philadelphia, PA.
Trisem, SE Massengill Co, Bristol, Tenn.
Metacresylacetate, Sultan Chemists, Inc, Hackensack, NJ. Adaptic, Johnson & Johnson Dental Products Co, E Windsor, NJ. Solu-Delta Cortef, The Upjohn Co, Kalamazoo, Mich.
TMS, Thread-Mate-System, Whaeldent, Inc. New York, NY. Robinson PT: Multiple canine teeth fistulae in a red uakari monkey. Vet Med Small Anim Clin 69:699, 1974. Sedgwick CJ, Cooper RW: Dental fistula in the squirrel monkey (Saimiri sciureus). J Zoo Anim Med 3:26-27, 1972. Olfert ED: Tooth root abscess and fistula in the squirrel monkey (Saimiri sciureus). Can Vet J 15:171-172, 1974. Greenstein ET, Hirth RS: Maxillary sinus fistula in a squirrel monkey with a diseased canine tooth. J A V M A 167:655-656, 1975. Swindler DR: Dentition of Living Primates. London, Academic Press, 1976, p 162. Colby RA, Kerr DA, Robinson HBG (ed): Color Atlas of Oral Pathology. Philadelphia, JB Lippincott Co, 1961, p 65. Leighton RL: Surgery of the head, thorax, abdomen, genitalia, and skin, in Catcott EJ (ed); Feline Medicine & Surgery. Ed 2. Santa Barbara, Calif, American Veterinary Publications Inc, 1975, pp 552-553. Baker GJ: Surgery of the head and neck, in Catcott EJ, Smithcors JF (ed): Equine Medicine & Surgery. Ed 2. Wheaton, Ill, American Veterinary Publications Inc, 1972, p 771. McGehee WHO, True HA, Inskipp EF (ed): A textbook of Operative Dentistry, ed 4. New York, McGraw-Hill Book Co inc, 1956, p 171. Roydhouse RH: Prevention of occlusal fissure caries by use of a sealant. J Dent Child 35:253-262, 1968. Helle A: Two fissue sealants tested for retention and caries reduction in Finnish children. Proc Finn Dent Soc 71:91-95, 1975. Handleman, SL, Washburn F, Wopperer P: Two-year report of sealant effect on bacteria in dental caries. J Am Dent Assoc 93:967-970, 1976.